The MidoriTM fiber-optic LED light source series combines state-of-the-art, solid-state illumination technology with Ushio’s distinctive optical design to create a compact and lightweight fiber-optic lightbox with very high output efficacy that is ideal for industrial applications where space is a premium. This mercury-free, long-life ULB-35 LED light source has instant-on and extended electronic intensity dimming capabilities. The ULB-35 series light sources conveniently accepts a 12VDC input voltage for portable battery operation. 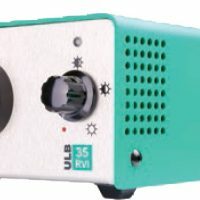 The ULB-35rvi is a single UV output unit that is equipped with an ACMI fiber receptacle, as well as separate Storz and Olympus screw-in adaptors are available to accommodate most common fiber cable types. 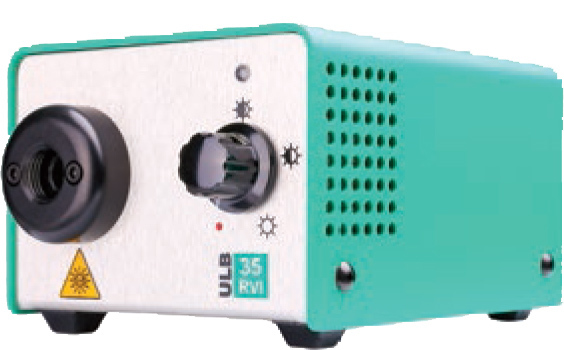 The ULB35ndt is a dual channel unit with both UV and VIS output capability to meet the most demanding applications by rotating the Olympus style adapter to the preferred output. Both light sources are equipped with an integrated filter to significantly reduce visible light in UV operation mode to meet the most demanding FPI applications.